A police officer stands outside an SUV, where a young black man sits in the driver’s seat. When the officer demands that the driver put his hands behind his back, the man is confused, his hands hovering mid-air. Though this interaction may appear routine, the role-play is staged by Pamela Wiley, ’72 Communication Studies. 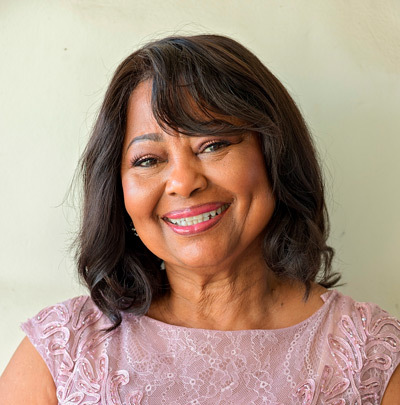 As a speech pathologist and president of the Los Angeles Speech and Language Therapy Center, Wiley has dedicated her career to providing treatment and services to people living with autism spectrum disorder and other diagnoses. In 2017, she attended a panel organized by actor and philanthropist Holly Robinson Peete featuring Charles Kinsey, an African-American therapist shot by the police while working with an autistic client in 2016. The panel also included two retired law enforcement officers. Struck by the role that race and disability sometimes play in interactions with the police, Wiley decided to develop a training program. Together with Peete and retired lieutenant Stan Campbell, Wiley leads Spectrum Shield, a weekend-long workshop that pairs her clients with autism with police officers. After the inaugural workshop, Wiley’s clients drove away with techniques for interacting with officers and officers learned that autism manifests in many behaviors and abilities. The program is one of many that Wiley has developed over the last 40 years at her practice, which she founded because she was frustrated by the lack of resources for families of color. Read about Wiley’s collaboration with actress Holly Robinson Peete in “When Autism Grows Up—and Encounters Cops,” published in The ASHA Leader. Julia Halprin Jackson is an advancement writer on San Jose State University's Strategic Communications and Marketing team. Congratulations, Professor Roth, what a distinction!